The web’s abuzz with the news that the BBC’s iPlayer has made its first tentative steps toward sanity and put together a Flash video based streaming service that’s DRM unencumbered. Roo’s put together a good review of the service, and assorted others have chimed in with their comments. Now the reason why I say “a bit, but not entirely like” was because I could’ve sworn I didn’t see any Flash media player chrome and instead was told that the programme wasn’t available. I flailed around for a bit instead, started looking at the help, which confusingly isn’t named help, but is named about BBC iPlayer, got to the part about streaming programmes and concluded, in a roundabout way that what I was trying to watch probably hadn’t been encoded yet. that’s the first page: two episodes of “Two Pints of Lager an…”, one episode of “The Late Edition”, one of “The Mighty Boosh”, one of “The Graham Norton Show”, one of “Never Mind the Buzzcocks”, one of “Strictly Come Dancing”, one of “Eggheads” (the design of which which makes me vomit), and one of “The Weakest Link”. Let’s see what’s on the second page. I spy a problem here. It’s like one of those memory card games, where you turn over cards and try and match pairs, right? There’s three episodes of “Love Soup” (they all look the same! ), two of “The Weakest Link” (they look the same too! 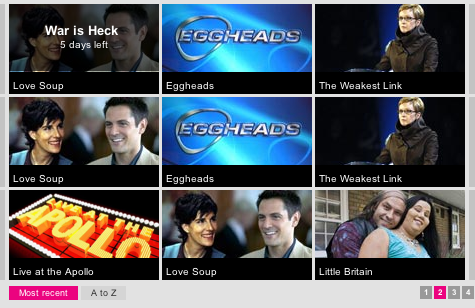 ), two of “Eggheads” (more vomit) and one each of “Live at the Apollo” and “Little Britain”. This is exactly what pissed me off about the American Airlines pseudo video-on-demand system I encountered on seatback video on the way back from Thanksgiving in November. 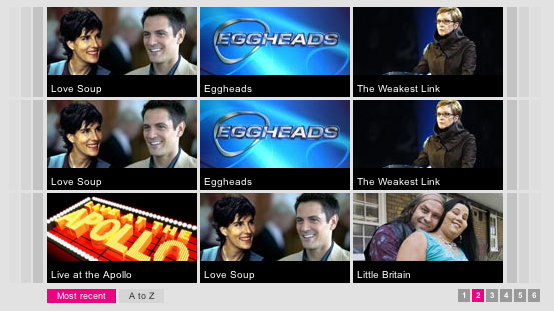 The EPG, such as it was, offered thumbnail pictures of each episode, which is all fine and well until you realise that if, say, you’re presenting six episodes of “Friends”, you end up with a screen that displays six identical icons of “Friends” and you have to click on each and every single one of them to find out what episode each icon represents. And that was only for six episodes of “Friends”. Imagine if you were browsing the entire back-catalogue – 10 seasons of over 20 episodes each! That’s at least 200 identical icons, and the most you could probably hope for would be some sort of arrangement by season. Well what else are you supposed to do? At least it’s a truncated title. Ah, but what if you’re showing “Friends” again and, for whatever reason the showrunners had, they decide to pad all of their programme titles with something like “The One Where” which means you’ve already lost 16 characters – three thanks to the ellipsis and thirteen thanks to the silly showrunners. Now, the search interface is a little different in that below each programme icon you also get a truncated episode title. It appears that for some programmes that title is actually a title, but for others (like EastEnders), it’s just a date. You don’t appear to get a programme name, episode title, and airdate, but I suppose when you’re only dealing with 7 days’ worth of content, that might not be such a big deal. Anyway. 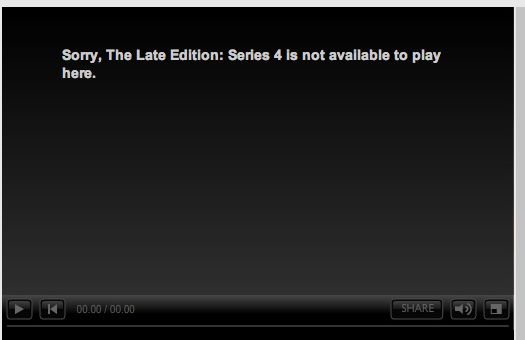 iPlayer Streaming is out, it works, more or less, and in a “just works” kind of way. It’s still beta, so I expect that we’ll see user interface kinks worked out, but it would’ve been quite interesting to see if the team at the Beeb had another different spin on “just lots of pictures of the same television programme”. 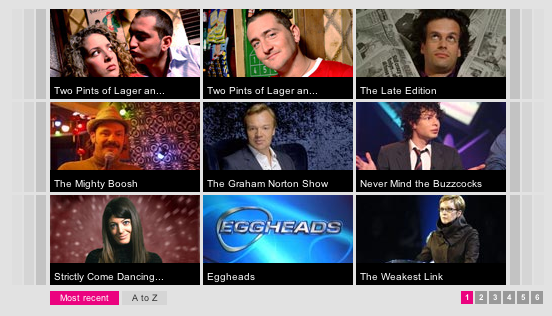 At this point, this post is dangerously close to segueing in to a rant about the pervasiveness of really, really bad EPG design and how when you’re dealing with about a hundred channels (something that iPlayer isn’t dealing with), scrolling through a list of them isn’t perhaps the best way to deal with it. Although what with Apple’s implementation of contact browsing on the iPhone, maybe that’s what some people think is the best solution.